You’ve likely heard of or seen a Big Green Egg® before. They’re hard to miss with their signature, ceramic egg-shaped body. 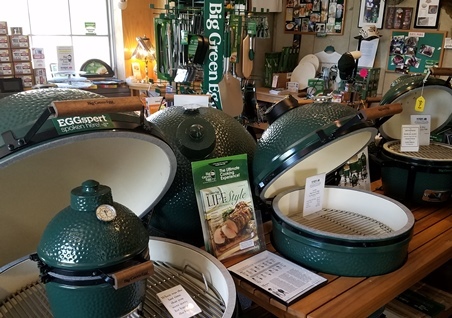 Since its inception in 1974, the Big Green Egg has been causing a buzz among backyard barbecue enthusiasts and head chefs, steadily growing in popularity. Here, you’ll find some detailed information about how it works, and what exactly makes it so special. The ceramic body of the Big Green Egg acts like a cutting-edge convection oven, allowing users to exercise total control over the temperature at which their food cooks. Using its patented air control vents, you can make certain your food remains at the exact cooking temperature you desire. A signature metal top on the egg controls the airflow in the cooking chamber, while a draft door on the bottom of it regulates the amount of air entering the fire box. This results in an evenly cooked meal suited to your exact taste. Another benefit of cooking with the Big Green Egg is that it’s much safer than other types of grills. This is because its ceramic shell is heat-resistant, so its surface doesn’t heat up like that of a metal grill. All of the heat is contained within the flame box installed at the bottom of the egg, so you never have to worry about brushing up against it and being burned. It is also extremely stable due to its design and secure cover. It’s the ideal grill to smoke food for hours, all you need to do is check the temperature occasionally. Cleaning up after a cookout can be a hassle, which is why the Big Green Egg is designed to be extremely low maintenance. The green glaze on its exterior helps reduce smoke stains and makes any build up easy to wipe away. The stainless steel cooking grid and other components inside the egg are self-cleaning in much the same way as an oven — excess heat burns off any fat or grease build up. Whether you’re a five-star chef, or love having block parties on the weekends, a Big Green Egg can be a great addition to your backyard BBQ arsenal. To learn more about the device, contact Nordic Stove and Fireplace, in Stamford, CT. Since 1972, they have been outfitting residents in Harbor Point and the surrounding areas with exceptional wood and electric stoves, gas fireplaces, and cooking accessories. Call them today at (203) 406-9881, or visit them online for a closer look at their inventory.